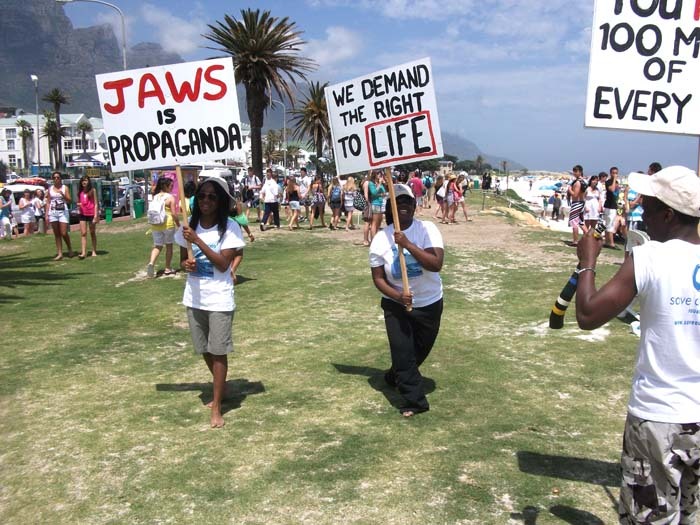 In 2004 I ran a shark protest, yes, you heard right, sharks protesting for their rights! 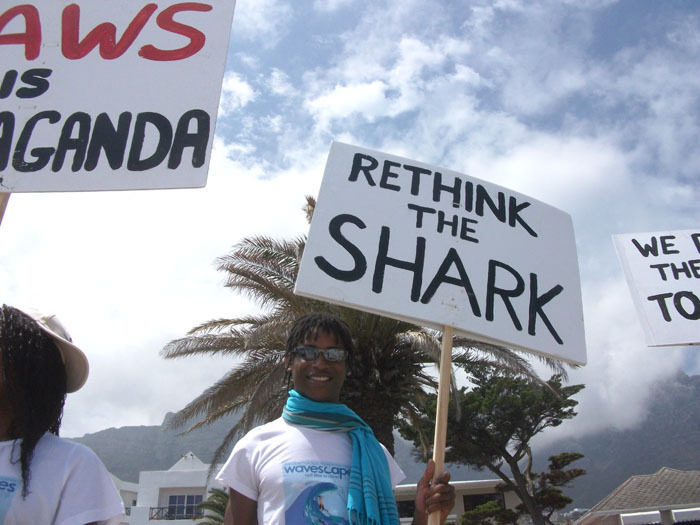 With the support of Saatchi and a number of volunteers, who pretended to be sharks holding protest boards out of the water, and during the Simon’s Town Festival, at which AfriOceans had a stall, we succeeded in raising awareness in a very unique way. Since then I threatened to use the boards again but shark conservation got hectic and they remained in my garage gathering dust and getting in my way. 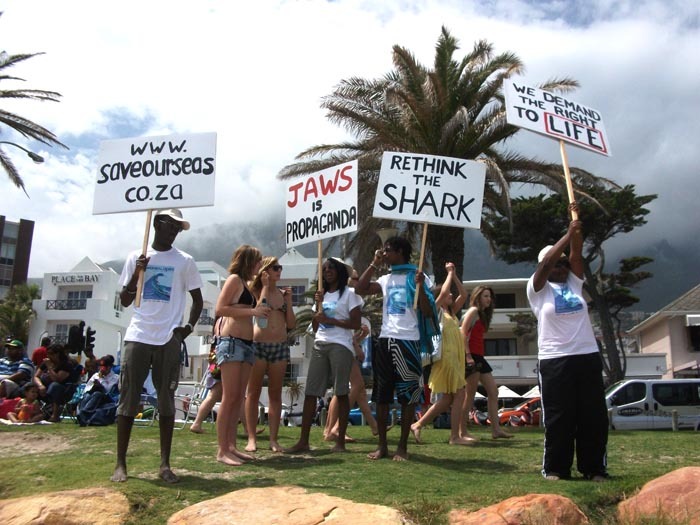 But the moment came when a few weeks ago we were proactively involved in the 350.org event on Camps Bay Beach. A wonderful support of volunteers – not in the water this time – marched across a packed beach creating attention and a talking point. This is the stuff l love doing and being part of, finding ways to raise awareness in the most compelling ways, and there are many new projects I am excited to be working on for next year. Overall it is a busy time at the Centre, and while everyone begins to wind down for the year end, we are busy preparing our school holiday programs. As the year draws to a close I feel a sense of relief, it has been another year with my plate overflowing while I played general manager, operations manager, financial manager, admin and more admin, and director of education and awareness! My expertise have been wasted on the wrong things, which has frustrated. Despite requesting help in the form of more funds to employ a manager it has not been forthcoming. With the Centre, an AfriOceans project funded by SOSF, up and running, however, the New Year promises help in the form of a new manager, which is a massive relief so that I can focus on what I love most – being creative and developing exciting events and programmes, educational materials, films etc. that help raise awareness, AND being in the water more often with my camera – I can’t wait! Although I have only been in the position of Head of Education of SOSSC for a short time, I have witnessed first hand the remarkable qualities that you possess as a passionate activist turned educator, who has been able to take Environmental Education to an exciting, new level by bringing ‘difficult to understand’ scientific research about the plight of sharks across to the general public, in unique and innovative ways. Educating both children and adults alike about the intrinsic value of sharks is probably one of the most difficult subjects to teach in the wide environmental education arena, due to poor perceptions, bad press and ‘sensationalism’. After being exposed to your wide range of carefully thought out teaching methods that are grounded in fact – based, scientific research, linked to the school curriculum across all 8 learning areas and delivered with passion and conviction, I firmly believe that the Save our Seas Foundation should be extremely proud of your significant educational achievements in a very short passage of time. To reach over 10 000 school learners and 700 school teachers , many from historically disadvantaged communities, who have visited the SOSSC, is a phenomenal success story. But this is not the whole story, because to you it is not a number’s game. It is about telling the real story about sharks that some feel uncomfortable to hear because each one of us needs to take responsibility for what is really happening in our oceans. That 100 million sharks are killed worldwide every year is one of the greatest travesties that have ever been exposed and it is only through taking your audience ‘out of their comfort zone’, does learning really take place and action is initiated. The time of awareness is over. As educators and scientists alike, we have a small ‘window of oppurtunity’ of maybe 10 years, to turn things around. It’s time for action! The quality of the education presently being delivered by the SOSSC is what sets it apart from every other Environmental Education Centre in South Africa. I have personally visited nearly all of them and have witnessed the below average quality of teaching that is being offered and the superficial learning that is taking place. Furthermore, there is a distinct lack of focus on relevant Learning and Teaching Support Materials (LTSM’s). 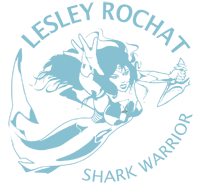 In comparison, the educational programme that you have personally developed around ‘Mighty Maxine’ and the M-Sea programme and the associated Teachers Handbook are world class and deserve the same recognition that you have received for your award winning documentaries, including ‘Sharks in Deep Trouble’. I have shown this documentary to a number of diverse adult audiences recently with very powerful responses, including standing ovations. The true story of the plight of sharks in our waters needs to be told, so that the pathetic laws that allow such barbaric behaviour can be challenged and rewritten. We cannot stand by and allow this to continue any longer. The children that I speak to in our lessons demand no less of us. People often say to me that ‘you can judge the state of a nation by how we treat our animals’. We owe it to future generations to ‘be the change that we want to see in the world’. Whether it is your outstanding Shark Dreams play that reached 6000 children during 2009, your groundbreaking ‘Rethink the Shark’ campaign that reached every corner of the globe, your involvement in beach festivals, climate change actions and surfing competitions, you have led the SOSSC with distinction, integrity and passion that makes all of us proud to be associated with you and i feel deeply privileged to be even a small part of the ongoing, unfolding story that is the Save our Seas Shark Centre. You are a true ambassador for the sharks, who have no rights, no voice and have no platform to negotiate. Please keep doing what you are doing because through your actions, passion and commitment, you will continue to guide us, through your unique insight and perspective, in all our efforts to carve a brave new world, where all sharks are properly protected and they finally receive the recognition they so desperately deserve as integral to the continued survival of all species on our blue planet.